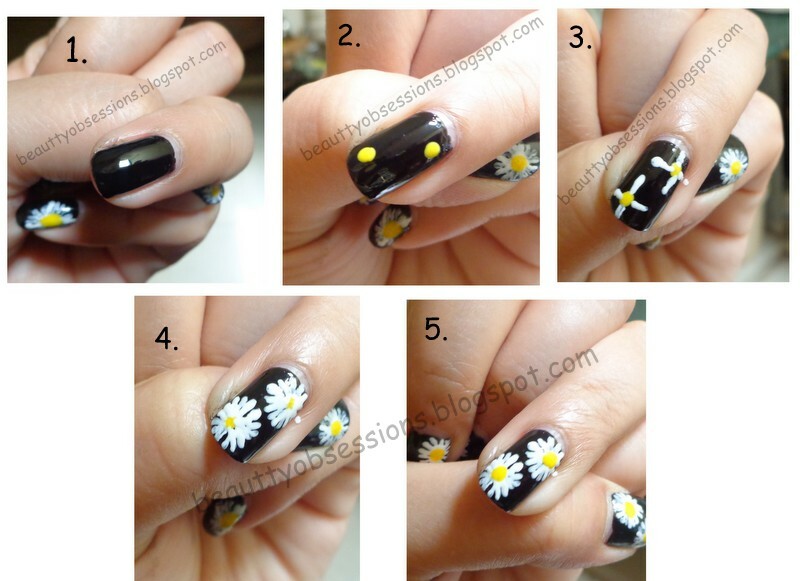 Daisy Flowers on a Lazy Day - Step By Step NailArt Tutorial.. I am feeling super lazy today.. Don't know why..?? Then thought to share a nail art with you guys which I have drawn 2-3 days before... Spring is already over and hot summer has already started.. But I am in a phase of drawing spring nailarts.. I have a couple of spring nailarts to share.. So here is one of them.. ( Have you seen my first spring inspired nailart,click HERE to see) ..
Daisy flowers are one of those beautiful flowers of spring season.. In my balcony I have also a daisy plant and there are two big flowers .. I wanted to share those,but see , forgot to click.. Anyway I will update the pics here soon.. So now move to the nailart tutorial..
1- First apply a base coat on your nails to prevent from damage .. Then apply a good layer of nail paint which you want to keep as the base colour.. Here I have taken black as the base colour but you can choose and darker shade. 2- Then with the help of a dotting tool put two yellow drops like in the picture.. Here the yellow drop acts like the middle of the flower. Let it be dry a little. 3- Then draw white lines in the form of a plus sign like in the picture with the help of a thin nail brush.. You can opted toothpick instead of brush and dotting tool as well. 4- Then fill the gaps with several lines ..( see the picture) and finally it will look like a flower..
5- Now put a yellow drop in the middle of the flower again to clear the look. Wait to dry completely .. and apply a nice top coat to luck the creation.. Here is the final output...How is it ?? Hope you all like it.. Do share your feed back in comment section.. Bye.. Simple and very cute nail art. Very nice and interesting post here. I like it. Thanks for sharing. You are welcome.. Glad you liked it..
Lovely nail art!! Daisy looks superb! It's so pretty and scream summer. Loved it.